UPDATE: The link on this page has changed. Go here to see the photos of American’s new Main Cabin Extra seats. American began quietly testing their new Main Cabin Extra premium economy seats back in June, and then three or four weeks ago they started installing them on the rest of their 767-300 fleet. Finally, someone has taken some photos and posted them online. Traveling Better Forums member MiamiBeach was on a 767-300 that had the new seats and took a few photos and shared them on the forum. Go here to see them (click on the thumbnails for larger sized images). 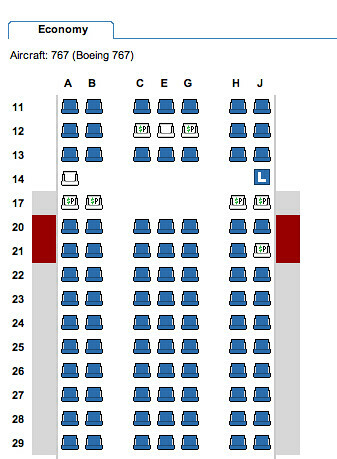 Photo: Seat map from an American Airlines 767-300 with Main Cabin Extra seats installed. Your title is misleading, it implies that there will be photos of the seats, not just the seatmap. Agreed, there are no photos here.